So that he could not finish what he had attempted. According to this source, the tomb of Bel/Marduk was destroyed by Xerxes, who was the Persian king (and ruler of Babylon) from 486 to 465 b.c.e. 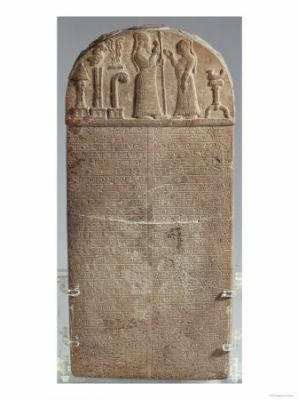 Strabo, in Book 5, had earlier stated that Belus was lying in a coffin when Xerxes decided to destroy the temple, in 482 b.c.e. Accordingly, Marduk died not long before (Germany?s leading Assyriologists, meeting at the University of Jena in 1922, concluded that Marduk was already in his tomb in 484 b.c.e.). Marduk?s son Nabu also vanished from the pages of history about the same time. And thus came to an end, an almost human end, the saga of the gods who shaped history on planet Earth. That the end came as the Age of the Ram was waning was probably no coincidence, either. With the death of Marduk and the fading away of Nabu, all the great Anunnaki gods who had once dominated Earth were all gone; with the death of Alexander, the real or pretended demigods who linked Mankind to the gods were also gone. For the first time since Adam was fashioned, Man was without his creators. In those despondent times for Mankind, hope came forth from Jerusalem. Amazingly, the story of Marduk and his ultimate fate in Babylon had been correctly foretold in biblical prophecies. We have already noted that Jeremiah, while forecasting a crushing end for Babylon, made the distinction that its god Bel/Marduk was only doomed to ?wither? ?to remain, but to grow old and confused, to shrivel and die. We should not be surprised that it was a prophecy that came true. But as Jeremiah correctly predicted the final downfall of Assyria, Egypt, and Babylon, he accompanied those predictions with prophecies of a reestablished Zion, of a rebuilt temple, and of a ?happy end? for all nations at the End of Days. It would be, he said, a future that God had planned ?in his heart? all along, a secret that shall be revealed to Mankind (23:20) at a predetermined future time: at the End of Days you shall perceive it? (30: 24), and ?at that time, they shall call Jerusalem Yahweh?s Throne, and all nations shall assemble there (3: 17). Unable to save themselves from capture. These prophecies, as did Jeremiah?s, also contained the promise that Mankind will be offered a new beginning, new hope; that a Messianic Time will come when ?the wolf shall dwell with the lamb.? And the Prophet said, ?it shall come to pass at the End of Days, that the Mount of Yahweh?s Temple shall be established as foremost of all mountains, exalted above all hills; and all the nations shall throng unto it.? ; it will be then that the nations ?shall beat their swords into ploughshares and their spears into pruning hooks, nation shall not lift up sword against nation, and they will no longer teach war? (ISAIAH 2:1-4).